Squash House Quilts: It’s Almost Over…. Even though it has been a short, 3-day week for me, I’m glad it’s almost over! I have a pile of laundry, some must-do ironing or I will be wearing the same thing to work every day next week, and a hankering to do some more sewing! First things first, though. Tomorrow we are heading into Seattle to check out marble. We are putting butcher block counters in the kitchen at the Squash House, and on one of them I would like a marble inset for pastry making! I emailed the company, Grothouse Lumber, who manufacture the butcher block and they quickly responded saying this is something quite commonly done. They use a flexible silicone for the grout between butcher block and marble. I’m hoping we can pick up a nice “left-over” piece at a good price and have it milled into place. My Nov/Dec issue of Fons and Porter’s Love of Quilting came yesterday. Marianne and Liz are my quilting guru’s! I began watching their show on PBS many years ago and have been a loyal follower ever since. Most of what I initially learned about quilting came from these two very talented women. 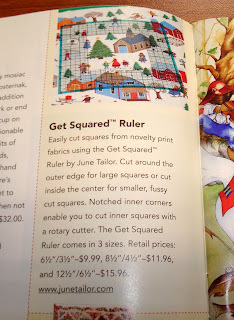 There are two quilts in this issue that I would love to make. 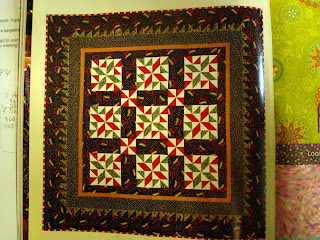 This Thimbleberries quilt - Christmas Sparkle - looks like fun! I would use lighter colors, but I do love the design. And this one by Gudrun Erla also caught my eye. I’ve always loved stars, but lately pinwheels have been getting my attention - here’s a great chance to combine both! 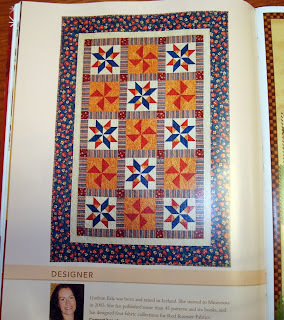 And one of my favorite parts of every issue of Love of Quilting - another great notion to add to my collection. I could have really used this on the Christmas Cottage Exchange! I love watching Fons and Porter but we don't get it on our pbs anymore. Enjoy your week-end too.